Department of Chemistry (PG Biochemistry), Mount Carmel College, Autonomous, Palace Road, Bengaluru - 560052, Karnataka, India. ABSTRACT: Biofilms are protective organic extracellular polymeric substances secreted by a microbial population which prevents the penetration of antimicrobial substances such as antibiotics. The existence of biofilms has become a significant problem in the case of infections as well as industrial processes. Although, biofilms may act as an advantage to the microbial community, they are found to cause food spoilage, unpleasant odors, pipe blockage, infections, etc. Biofilms play a crucial role in causing persistent UTIs which undergo frequent relapses, seen most commonly in women, children and aging adults. In the present investigation, bacterial samples isolated from UTI samples of infected patients were characterized. The capacity of the UTI isolates to form biofilms is analyzed using biofilm assay done by subjection of samples to primary and secondary screening by ELISA plate reader. Further on, N-acyl homoserine lactone (AHL), an autoinducer responsible for the formation of biofilms in gram-negative bacteria was extracted and estimated colorimetrically and spectroscopically by using Fourier Transform Infrared Spectroscopy (FT-IR). The AHL that was extracted showed a characteristic absorbance for C==O bond of lactone ring, and N==H and C—O bond of acyl chain analyzed from graphs obtained by FT-IR. INTRODUCTION: A biofilm is termed as a cooperative community composed of an extracellular polymeric substance (EPS). It is the most widespread form of living for a major population of microbes under hydrated conditions. The biofilm on an indwelling surface consists majorly of the adherent organism, polysaccharides, water, and the extracellular products excreted by them 1. The microbial cells embedded within a biofilm are provided with a dynamic environment which allows them to reach a state of homeostasis and organize themselves efficiently to make optimal use of the nutrients. Exopolysaccharides are responsible for the stability of a biofilm, but they can also be affected by certain enzymatic activities2. The cells consisting of biofilm-forming properties are found to express certain characteristics different from planktonic cells. Increased defiance to antimicrobial agents is one of these characteristics. Due to the heterogeneous nature of the biofilm, many defense mechanisms are operating within a microbial community. The presence of microorganisms in biofilm increases their resistance by 10-1000 folds against antimicrobial agents 3, 4. Thick and thin biofilms are found to show a difference in resistance to antimicrobial agents 5. Under conditions of starvation, the bacterial cells slow down their growth 6. This change of their growth pattern from exponential to slow or no growth is generally accompanied by an increase in the resistance to antibiotics. Mature biofilms show a slow growth of the bacteria. Since the cells growing in biofilms show slow growth and nutrient limitations, the physiological change occurring can be the cause for the increase in antibiotic resistance 7, 8. Microbial biofilms occupy about 99% of the surfaces. The competition between microbes for nutrients and other growth factors play an important role in the development of a biofilm. The chemical signals produced by the high density of organisms in the biofilm signals with the responding cells in the biofilm, thus by this factor the complexity of the biofilm structure is increased. Also, the expression of cognate receptors, exopolymeric molecules, and different adhesins also help in the formation of biofilms. Quorum sensing mechanisms are possibly used by many bacteria to regulate biofilm formation and other social activities. Biofilms help the bacteria to carry out various coordinative functions such as collective actions and division of labor with their neighbours 9. Many gram-negative bacteria synthesize acyl-homoserine lactone (acyl-HSL) signal molecules that serve in a cell-to-cell communication system termed as quorum sensing. Quorum sensing enables population density control of gene expression. Quorum sensing has been implicated as an important factor in the expression of virulence genes in animal and plant pathogen. Although, all acyl-HSLs possess an HSL ring, the length of the acyl side chain and the substitutions on the side chain differ and are specificity determinants for different quorum-sensing systems. Pathogenic strains like Escherichia coli cause UTI, Klebsiella pneumonia, Proteus mirabilis, Enterococcus faecalis, Pseudomonas aeruginosa and Staphylococcus saprophyticus. It can be caused by both gram positive and gram negative organisms 10. The most common pathogen is E. coli classified as uropathogenic Escherichia coli (UPEC) 11. Sometimes there can be a recurrent infection which can be reinfection, i.e., which is caused by another strain or there can be a relapse in which case the same microorganism as the original UTI can cause the disease again 12. The persistence of biofilms is a major cause of worry in case of patients requiring the use of catheters as Catheter-Associated UTI (CAUTI) is the most common nosocomial infection worldwide 13. The coating of catheters with antimicrobial agents can help reduce the risk of being infected, but the chance of the organisms developing resistance to it is high 14. Multi-drug resistance species arose due to improper use of antibiotics which causes a major threat in the field of modern medicine. This occurs because there is an accumulation of large numbers of resistance plasmids each containing genes that confer resistance against a particular drug. If there is an increased expression of genes for multidrug efflux pumps, it results in increased levels of resistance against a drug. Multidrug resistance levels are on the rise because of liberal amounts of antibiotics used in human therapy, animal farming and aquaculture 15. The present study is aimed at isolating and characterizing biofilm forming multiple drug-resistant bacteria from UTI samples. Bacterial Isolates: Bacterial cultures that were multi-drug resistant were isolated from UTI samples of a diabetic patient from Bhagwan Mahaveer Jain Hospital, Bengaluru. Two strains were chosen out of the four isolated strains based on their biofilm formation in TSB medium after overnight incubation. Biochemical Classification of Bacterial Isolates: The obtained samples were cultured onto McConkey agar plates which are a differential medium. It is used to differentiate colonies that ferment lactose, provided in the medium. The culture plates were incubated at 37 °C for 24 h.
Various biochemical tests were performed to characterize the isolated bacterial strains such as MR-VP, indole, citrate, oxidase. (Experiments in Microbiology, Plant Pathology, and Biotechnology, K. R. Aneja 2003). Primary Biofilm Formation Assay: The cultures were grown overnight in TSB and after 24 h were introduced into fresh TSB containing 1% glucose. A 1: 100 dilution of the culture with TSB containing 1% glucose was performed. The optical density of the cultures was determined by spectrophotometry at 600 nm. Readings were taken every half hour concerning the generation time up until an OD of 0.5 was reached. The culture was diluted from 108 CFU/ml to 103 CFU/ml by serial dilution. 100 µl of each dilution was added to the wells of a 96 well microtiter plate in triplicates. Un-inoculated TSB with 1% glucose was used as the control. The plate was incubated at 37 ºC for 30 min. After incubation, the cultures were removed from the titre wells and washed with 0.1M phosphate buffer saline (PBS). The PBS was drained and 150 µl of uninoculated TSB with 1% glucose was added to all the wells. The plate was read at 600 nm in the ELISA plate reader 16. 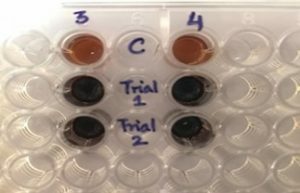 Secondary Biofilm Formation Assay: Onto 2 ml of TSB media with 1% glucose a loop-full of bacterial cultures were inoculated. This was diluted thrice using TSB containing glucose. 100 µl of un-inoculated media was used as a control. 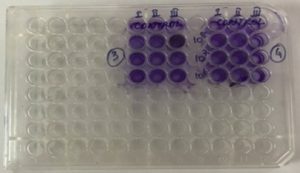 The three dilutions were added to the microtiter plate in volumes of 100 µl, and triplicates were maintained. The entire plate was incubated overnight at 37 ºC with no shaking. The next day, the media was aseptically removed, and the wells were washed with water. 10 µl of PBS was added to the wells which were then replaced by 150 µl of methanol and incubated at room temperature for 20 min. Methanol was then aspirated, and 200 µl of 1% crystal violet was prepared and added to the wells. The wells were then washed with distilled water and allowed to air dry at room temperature. 200 µl of 33% glacial acetic acid was added to the wells once the plate was dry. The plate was read at 490nm with the help of ELISA plate reader 17. AHL Extraction from Bacterial Source: Into Mueller-Hinton broth a loop-full of bacterial cultures were inoculated and left for incubation overnight at 37 ºC. Into centrifuge tubes, 1.5 ml of inoculated broth was taken and centrifuged at 10,000 rpm for 15 min at room temperature. The supernatant obtained was retained and further, on liquid-liquid extraction was performed. In a fresh centrifuge tube, the supernatant was retained and an equal volume of ethyl acetate was taken and was shook vigorously for 10 min after which it was allowed to stand undisturbed for another 10 min. The mixture then separates into the upper organic layer and lower aqueous layer. The organic layer is aspirated by micropipette and dried at 40 ºC on a watch glass. The aqueous layer was treated with ethyl acetate, and the above extraction procedure was repeated two more times. Each time the upper organic layer was collected and dried in a hot air oven at 40 ºC. Once the extract was dried the powder was dissolved in ethyl acetate, and the organic layers obtained from the three trials were combined and stored for detection 17. AHL Detection: 10-50 µg/mL dilutions of phthalic anhydride were prepared in distilled water, and the absorbance was taken to obtain a standard graph. The AHL extract obtained from each bacterial culture was added to microtiter wells in volumes of 40 µl. 2M hydroxylamine and 3.5M NaOH were mixed in a ratio of 1:1 and 50 µl of this mixture was added to the wells. A mixture of 10% ferric chloride in 4M HCl and 95% ethanol prepared in the ratio of 1:1 was next added to the wells in volumes of 50 µl. Absorbance was read at 520 nm 18. AHL Determination: AHL extraction was analyzed for lactone functional groups by Bruker-alpha FT-IR 19 where a drop of extracted AHL was placed in between two KBr plates and subjected to IR. RESULTS AND DISCUSSION: The establishment of bacterial biofilms has been considered an essential pathogenic trait in many chronic infections in modern clinical microbiology. Chronic and persistent processes clinically characterize a medical device or implant-associated biofilm infections. These infections are resistant to the highest deliverable levels of antibiotics, often resulting in significant tissue damage and long-term suffering of patients. Due to their protective property, biofilms resulting in persistent infections cannot be resolved with standard antibiotic treatments. Since the problem of bacterial group behaviors has not been considered until recently, the strategies required to cure infections caused by biofilms have not been devised. Therefore, understanding bacterial social behaviors and their molecular mechanisms in the development of biofilms will significantly facilitate the development of novel strategies in the prevention and treatment of biofilm infections. Isolation and Characterization of Bacteria: Bacterial cultures identified as multi-drug resistant were isolated from a diabetic patient suffering from UTI. The obtained samples were cultured onto McConkey agar plates which is a differential medium, to differentiate colonies that ferment lactose, provided in the medium. The colonies were cultured onto the plates and incubated at 37 °C for 24 h. The color of clones varied from pink to red. The obtained cultures were further isolated by further subculturing them onto uninoculated McConkey agar plates. The colony characteristics of the pure isolates were as tabulated in Table 1. From the above table, the colony characteristics were noted and the four isolates obtained were inoculated into TSB and left for overnight incubation at 37 °C. The following day, the level of biofilm formation was noticed at the surface of the incubated media and at the inner sides of the tubes. Isolate 3 and 4 were found to exhibit maximum biofilm formation and hence further analysis was carried out using them. Biochemical Identification: The bacterial isolates obtained were identified by performing various biochemical tests such as IMViC test, oxidase test, catalase test, casein hydrolysis, urease test, starch hydrolysis and growth on EMB agar. The result of each test was further studied to identify the organism. Primary Biofilm Formation Assay: The assay is carried out to check the ability of the isolate to form biofilm Fig. 2. 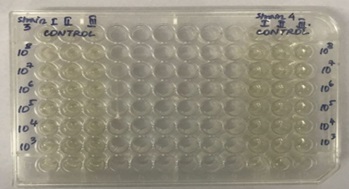 Primary biofilm attachment assay showed high levels of reading using an ELISA plate reader between the first three dilutions as these have lesser dilutions or more number of colonies. Fig. 3 is a graph of the obtained values. Secondary Biofilm Formation Assay: This assay was performed overnight in microtiter wells Fig. 4. The incubation is to provide sufficient time for the biofilm to form on the walls of the well. The isolates presented high biofilm forming ability, and the values are represented in Fig. 5. AHL colorimetric Detection and Estimation: The amount of AHL was detected to be 16 µg/mL approximately for isolate 3 and 15 µg/mL approximately for isolate 4 using the standard graph. AHL Determination: FT-IR spectrophotometric determination of the extracted AHL sample was performed. This was performed based on the principle that in the infrared region of the electromagnetic spectrum (4000 - 600 cm-1) most molecules absorb light. The absorption peaks from the FT-IR graphs correspond to the bonds present in the sample. They are characteristic of the vibrational modes of the bonds or molecules in sample that is analyzed. The plots are given below in Fig. 7 and 8 are the FT-IR results corresponding to isolate 3 and 4 respectively. Referring to the IR absorption table, it was concluded that both the strains 3 and 4 showed strong peaks in the range of 1750 - 1735 cm-1 which corresponds to the C=O bond of the lactone ring. Strong peaks were also observed between 1300-1000 cm-1 which corresponds to C-O bond in AHL. Peaks were obtained at 1736.69, 1233.93 and 1043.41 in the case of isolate 3 corresponding to C-O in AHL whereas peaks were obtained at1736.78, 1233.37 and 846.91 in the case of isolate 4. CONCLUSION: The isolation of pure colonies from the urine sample of diabetic patients was carried out, and once pure cultures were obtained on McConkey agar plates, they were further classified and characterized by various biochemical tests which included IMViC, oxidase test, catalase test, casein hydrolysis test, urease test, and starch hydrolysis test. Primary and secondary biofilm formation assay was performed to confirm the formation of biofilm production by the isolated microorganisms, and then AHL extraction was performed by liquid-liquid extraction using ethyl acetate. Using the standard curve of phthalic anhydride, the extracted AHL was quantified. The qualitative determination of double bonds present in AHL was determined by FT-IR. Strains 3 and 4 showed strong peaks in the range of 1750 - 1735 cm-1 corresponding to the presence of C=O bond of the lactone ring and strong peaks in the range of 1300-1000 cm-1 which corresponds to C-O bond in AHL. At 1736.69, 1233.93 and 1043.41, peaks were obtained for isolate 3 and isolate 4 had peaks at 1736.78, 1233.37 and 846.91. ACKNOWLEDGEMENT: The authors wish to acknowledge the Department of Chemistry (PG Biochemistry) and the management of Mount Carmel College Autonomous, Bengaluru for funding this project and offering their facilities for the analysis. Trautner BW and Darouiche RO: Role of biofilm in catheter-associated urinary tract infection. American Journal of Infection Control 2004; 32(3): 05, 177-183. Sutherland I: The biofilm matrix - An immobilized but dynamic microbial environment. Trends in Microbiology 2001; 9(5): 222-227. Prosser BL, Taylor D, Dix BA and Cleeland R: Method of evaluating the effects of antibiotics on bacterial biofilm. Antimicrobial Agents and Chemotherapy 1987; 31(10): 1502-1506. Nickel JC, Ruseska I, Wright JB and Costerton JW: Tobramycin resistance of Pseudomonas aeruginosa cells growing as a biofilm on urinary catheter material. Antimicrobial Agents and Chemotherapy 1985; 27(4): 619-624. Cochran WL, Mcfeters GA and Stewart PS: Reduced susceptibility of thin Pseudomonas aeruginosa biofilms to hydrogen peroxide and monochloramine. Journal of Applied Microbiology 2001; 88(1): 12, 22-30. Tuomanen E, Cozens R, Tosch W, Zak O and Tomasz A: The rate of killing of Escherichia coli by -lactam antibiotics is strictly proportional to the rate of bacterial growth. Microbiology 1986; 132(5): 1297-1304. Brown MR, Allison DG and Gilbert P: Resistance of bacterial biofilms to antibiotics a growth-rate related effect. Journal of Antimicrobial Chemotherapy 1988; 22(6): 777-780. Wentland E, Stewart P, Huang C and Mcfeters G: Spatial variations in growth rate within Klebsiella pneumoniae colonies and biofilm. Biotechnology Progress 1996; 12(3): 06, 316-321. Li YH and Tian X: Quorum sensing and bacterial social interactions in biofilms. Sensors (Basel, Switzerland) 2012; 12(3): 2519-2538. Flores-Mireles AL, Walker JN, Caparon M and Hultgren SJ: Urinary tract infections: Epidemiology, mechanisms of infection and treatment options. Nature Reviews Microbiology 2015; 13(5): 04, 269-284. Ronald A: The etiology of urinary tract infection: Traditional and emerging pathogens. Disease a Month 2003; 49(2): 71-82. Soto S, Smithson A, Horcajada J, Martinez J, Mensa J and Vila J: Implication of biofilm formation in the persistence of urinary tract infection caused by uropathogenic Escherichia coli. Clinical Microbiology and Infection, 2006; 12(10): 1034-1036. Tambyah PA: Catheter-associated urinary tract infections: Diagnosis and prophylaxis. International Journal of Antimicrobial Agents 2004; 09: 24, 44-48. Siddiq DM and Darouiche RO: New strategies to prevent catheter-associated urinary tract infections. 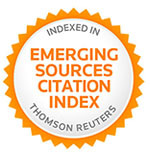 Nature Reviews Urology 2012; 9(6): 04, 305-314. Nikaido H: Multidrug resistance in bacteria. Annual Review of Biochemistry 2009; 78(1): 06, 119-146. Stepanović S, Vuković D, Hola V, Bonaventura GD, Djukić S, Ćirković I and Ruzicka F: Quantification of biofilm in microtiter plates: Overview of testing conditions and practical recommendations for assessment of biofilm production by Staphylococci. Apmis 2007; 115(8): 08, 891-899. Taghadosi R, Shakibaie MR and Masoumi S: Biochemical detection of N-Acyl homoserine lactone from biofilm-forming uropathogenic Escherichia coli isolated from urinary tract infection samples. Reports of Biochemistry & Molecular Biology 2015; 3(2): 56-61. Yang Y, Lee T, Kim JH, Kim EJ, Joo H, Lee C and Kim B: High-throughput detection method of quorum-sensing molecules by colorimetry and its applications. Analytical Biochemistry 2006; 356(2): 297-299. Shikh-Bardsiri H and Shakibaie RM: Antibiotic resistance pattern among biofilm producing and non-producing Proteus strains isolated from hospitalized Patients; Matter of Hospital Hygiene and Antimicrobial Stewardship, Pakistan Journal of Biological Sciences 2013; 16: 1496-1502. Rajkumar Y, Asma N and Shlini P: Isolation and characterization of biofilm forming multiple drug resistant bacteria from patients infected with UTI. 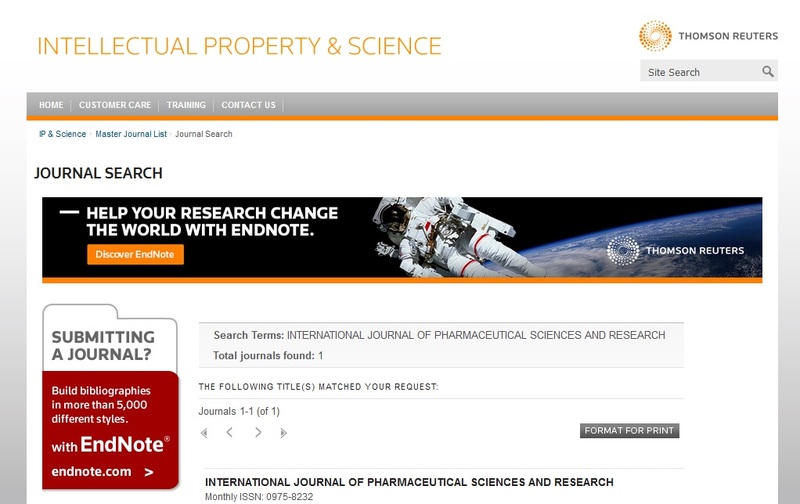 Int J Pharm Sci & Res 2019; 10(4): 1922-28. doi: 10.13040/IJPSR.0975-8232.10(4).1922-28.